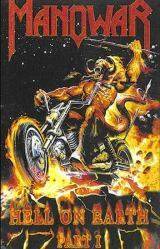 MANOWAR - HELL ON EARTH PART 1 (DVD) | Online Shop | Wizard LTD. Album: "HELL ON EARTH PART 1 (DVD)"
You now have the chance to experience “Hell On Earth Part 1” in full digital video and 5.1 Surround sound. Manowar, whose 1987’s "Fighting The World" was the first all digital heavy metal recording, has built a reputation for taking advantage of state-of-the-art technology. So it comes as no surprise that the band is not merely entering, but storming into, the DVD arena on November 19, 2001 with “Hell On Earth Part 1”.